It seems that the chinese company OnePlus does not stop in the effort to be at the forefront. In addition to announcing that it will use the Snapdragon processor 855 in 2019, the company also will launch a phone OnePlus 5G, to accompany a model with 4G LTE. In addition to these developments, it was revealed the news of a partnership in the Uk with carriers that support the network 5G, which shows the emphasis that OnePlus is putting in new technology. As expected, these advances have given rise to a series of rumors, but now everything seems to indicate that we could see the phone in its initial stages before what had been speculated: OnePlus announced that it will display a prototype of the phone OnePlus 5G in the Mobile World Congress in Barcelona. This prototype will be unveiled on the 26th of February in an event called “Connect with the OnePlus Community over 5G”, which seems oriented to give emphasis to the games, and where attendees can “experience the capabilities of 5G gaming”. At the Mobile World Congress in Shanghai last year, the CEO and founder of OnePlus, Pete Lau said that due to the relationship of the company with Qualcomm, OnePlus is increasingly becoming one of the first manufacturers of mobile phones, 5G. Lau pointed out that the launch will align with the first year that 5G will be available in the united States, and that also is confident that it will be the first to sell a phone with a capacity of 5G in Europe, through a partnership with the phone operator EE. A previous statement from OnePlus said that the phone would be available in early 2019, though it later the date was postponed until may of this year. Get ready to pay more money than normal for the privilege of owning a phone 5G OnePlus. Lau estimated that it will cost between $200 and $300 dollars extra for the 4G model, in an interview with TechRadar, which means that it is likely to cost around $750 to $850. Even so, it costs less than a flagship Apple or Samsung. OnePlus is known for offering specifications of high range to a lower price. The OnePlus 6T starts at $550 dollars and is powered by Snapdragon 845, the same set of chips present in the Samsung Galaxy S9 and the Google Pixel 3. 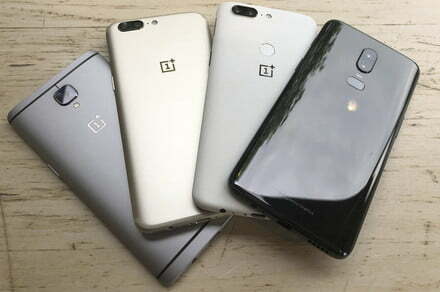 It is possible that the name of the phone 5G is not a “OnePlus 7″, because that would continue with the line of 4G phones, and that is why it is very likely that the company will adopt a new name for their phones 5G. In addition, it is a range of devices separately, and will be the second time in the history of the company that sold more than one family of phones. The latter was the OnePlus X of short duration, that existed next to the OnePlus 2. We will keep you informed as soon as we know the official name of the new phone 5G OnePlus. Are they really the first with Snapdragon 855? What began as a good news for OnePlus at the Summit Snapdragon in Hawaii, Qualcomm has taken a turn toward controversy, after it was clarified the comments and revealed more news. In the scenario of the event, Lau said that it would be the first manufacturer to launch a smart phone with the new chip Snapdragon 855 on the inside. However, it has now been clarified that this was a translation error, and I should have said “one of the first”. In the last few years, Samsung has been the first to use the latest processor flagship Snapdragon in a new device, so that the announcement of OnePlus broke the tradition and could have been seen as a great business for the newcomer OnePlus. The new chip Snapdragon is not only more powerful, but also stresses the improvement of the artificial intelligence (A. I. ), better processing of the camera, and other relevant functions. Now, in the light of the clarification, it seems that the news of OnePlus are not dissimilar to those of other manufacturers that also will use the new Snapdragon 855 Qualcomm in 2019. How did this happen? Everything points to problems of translation, and it says that the error could have run through several pieces of documentation used by OnePlus and Lau at the event, concluding with the erroneous statement, “we will be the first”. A spokesperson for OnePlus has issued a statement to Engadget, saying: “we Appreciate the opportunity to clarify that we will be one of the first to have access to and use of the Qualcomm Snapdragon 855, and we apologize for the fault in the communication”. This “communication failure” even extended to the account of Twitter of OnePlus, where the surprise announcement was highlighted in a message. This is all that is known so far about the new phone OnePlus 5G, but we will keep you informed as soon we get more news.